This is a simple thread that documents how many crestplates are needed for each building level. Also included are simple math to calculate how much gold each crestplate is worth for each level. Since they were released with the Orisons of Glory pt 9 event, I hope this thread will help you plan how to use the set of plates you earn to your best advantage. Building level, number of plates to build this level building, the amount of gold each plate is worth in upgrades, and the number of plates to reach this level building. UPDATE 2019-03-18: added in Fatesands plates and a description of artifacts and drops. Thank you to Radagast for keeping the initial data collection thread up to date, and to the numerous people who sent me info via PM. Missing from this section is gold/plate, which may be added if deemed relevant. These buildings don’t offer much return. Subterranean factory, war aviary, summoning circle, cursed foundry, circle of elements, titans lair, defensive fortress, guild, stronghold of shadow, and lookout fortress. All above gold/plate values for spy buildings will be slightly lower (buildings are slightly more expensive), defense will be slightly higher (building is slightly cheaper). Upon release, the only way to get Fatesands crestplates is via random drops from certain EBs: nk, noth, goth, lotl, zta, and rotwb. Each one drops a different “artifact” that opens automatically upon dropping (must check nf to see the drop). The artifacts then drop Fatesands Crestplate Shards. 5 of these shards then automatically combine into one Fatesands Crestplate. ZTA: Accursed Artifact: 5, 25, ? RotWB: Depraved Artifact: 3, ?, ? Last edited by Thrawn on Mar 25 2019, 5:53pm, edited 22 times in total. This post is a follow-up to the OP that will give some advice/numbers/math on how best to recycle old tokens for pure gold. Most of us have loads of old tokens, and most of us would like to get something out of it. Most people know the build a building/tear it down farming method, but that’s tedious at low building levels (where you get the most gold), and doesn’t give much gold at higher building levels (which takes much less time to burn tokens, but yields MUCH less gold per token liquidated). Deepmine buildings are ideally sold at level 4. This offers the highest possible return rate per token spent. For Fatesands, it currently appears to be more beneficial to level buildings with tokens as much as possible before tearing down. The gold/token sell value consistently increases with level. UPDATE 2019-03-18: added in Fatesands plates and rough calculations (building costs in gold were approximated, so the decimals may be a bit off, but the general gist is correct). So to summarize, I’ll tell you how efficient it is to build/tear down a building. You can decide what efficiency level works for you. High efficiency gold gain = takes a long time; low efficiency gold gain = takes much less time (except for Fatesands). Lowlands and highlands are not included here. Those buildings are not worth enough gold (IMHO) to farm any meaningful amount of gold from. Note: right now, Fatesands follows the opposite trend compared to all the other lands. It is better and worth more to build high level buildings (lv8) with plates before selling. Last edited by Thrawn on Mar 18 2019, 5:32pm, edited 3 times in total. Yeah, I'm bummed but not surprised about the diminishing returns at higher levels. 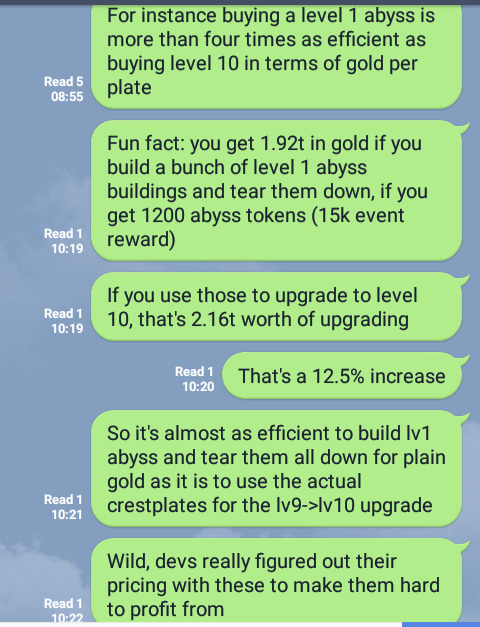 Over 4x more efficient to build lv1 in abyss compared to getting a lv10. Good to see. Wanted to test for myself, but to much effort. Thanks! Yeah zorkay, that's how I felt about lowlands. I'll add them at some point to make it complete, but I thought this was shorter and sweeter.